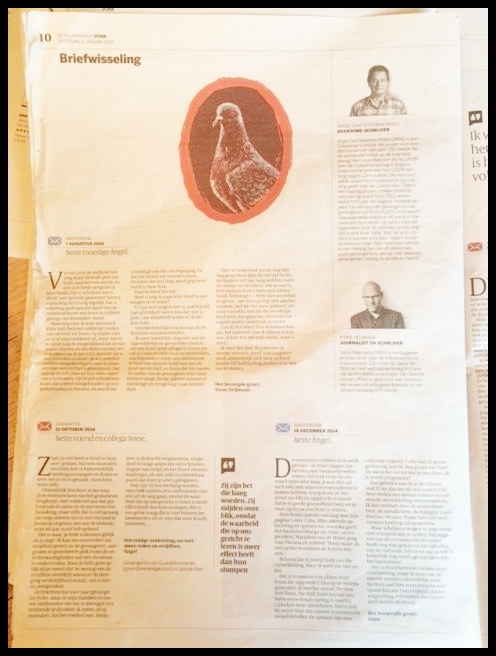 The renown Dutch writer and journalist, Toine Heijmans, a regular columnist for the national Dutch newspaper De Volkskrant, and who sponsored Ángel Santiesteban during his political imprisonment, published the correspondence they maintained during those two and a half years. He has dedicated four pages to it in the prestigious medium. We reproduce here the photos of the printed version. 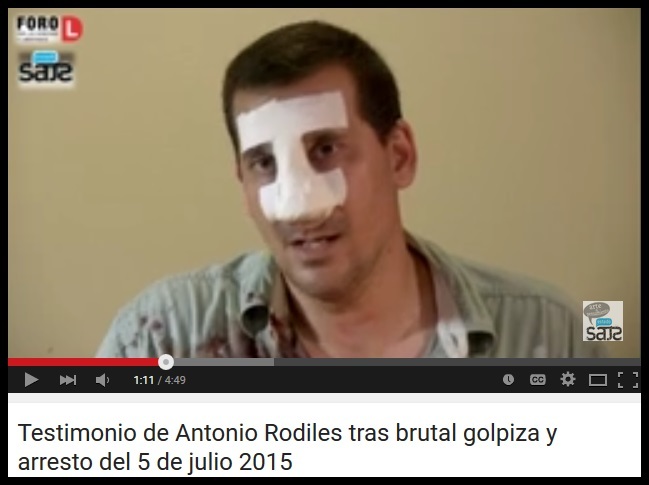 Screen capture — A Cuban filmmaker with the black tape of censorship literally covering his mouth. 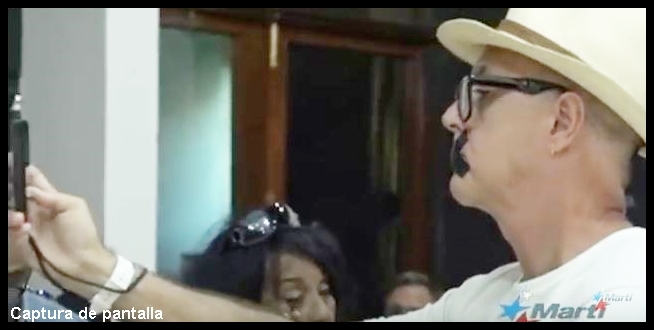 Ángel Santiesteban-Prats, Havana, 21 December 2015 — In order to complete my personal impression about the G-20* assembly in the Fresa y Chocolate Cultural Film Center this past November 28, I must recognize the solidarity and support of the filmmakers for their colleague, Juan Carlos Cremata, who, through writing, like Enrique Colina among others, showed their disgust and rejection of the assault dealt by the State against the artist, restricting his thinking and his work. The abuses and injustices committed by the officers and political police have been the last straw for the patience of the unionized filmmakers who — with new verve — have come together with their claims showing that they have matured as people, a society and artists. The wolf, who for more than half a century has sunk his teeth into the sheep that don’t abide by the rules of the fold, has paused now to wonder why, for the first time, the job of making them submit has been made difficult, and he waits, hoping that they will show some weakness or divide themselves in order to make his job of the bogeyman scaring the children easy. The dictatorship prefers us to be alone. I was amazed at the existing cohesion among the constituents of the G-20*, the clarity of their demands, like the Film Law that is indispensable to them in order to continue creating, but, above all, how well disposed they are to continue struggling until they achieve what they demand. They are not naive, they know that in the eyes of the dictatorship they have been converted into rebels who should be drowned, and if a crack exists, it would be inside one of the columns that integrate the group; and then, beginning with secret conversations with State Security, it would cede before the pressure and would begin to distort, scare, divide and misconstrue the objectives presented from the outset. Let’s hope that intelligence reigns over fear and serves to save this force that conveys their demands as artists, converts itself into a national necessity and triggers a new pattern in the country’s history. Their laudable, noble and courageous abilities are the preamble of a new era in which artists recover the dignity that has been lost for more than five decades, letting them be devoured and beaten by the totalitarian Regime for not receiving their punishment. It is new times, and democracy is the only system possible for any government; now there’s no space for authoritarian regimes (totalitarian) as, for example, Argentina and Venezuela, countries in which the opposition has just won the elections. Later will come those that are missing, and of course the Castro clan’s dictatorship will have no other option but to cede. With the arrival of freedom, Juan Carlos Cremata and all Cuban artists will recover the cultural spaces that they should not have lost through censorship and prohibitions. Juan Carlos Cremata deserves that space for his talent, strength and commitment. Let’s hope that without more delay, the Film Law gets approved for the benefit of the seventh art. 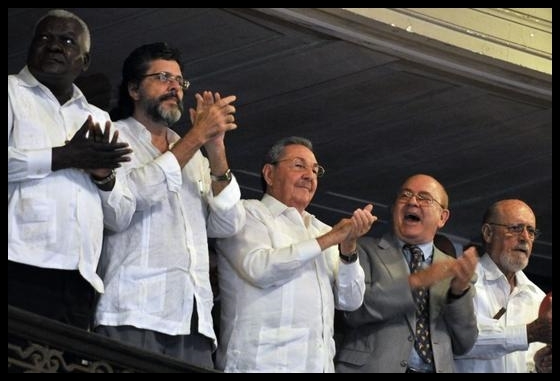 *Translator’s note: A group of Cuban filmmakers who demand the approval of a Film Law in Cuba. They defend independent production companies. At this meeting they debated censorship and analyzed the case of Juan Carlos Cremata, whose play “The King is Dying” was censored. Cremata was denied the right to stage another play in Cuba. Angel Santiesteban, Havana, 23 December 2015 — These days I’m immersed in the culmination of my next novel, which I should deliver in February for its possible publication; for this reason, I have dedicated the last two months, in a tireless way, to improving the prose, born from the heat and emotion of the most recent creation. I’ve barely taken time for cultural recreation, repressing — now that it’s possible — going to the theater, movies, ballet, among other spaces of my personal consumption, after having yearned for it for two and a half years, because the dictatorship that considers thinking differently to be dangerous, especially if it involves an artist, decided to send me to prison. It’s indisputable — and the reason for this post — that I haven’t been able to visit and comply with the demands of some friends, brother masons and political activists, who would like to see me more frequently. The rigor with which I apply myself to writing totally absorbs me, to the point that sometimes I lose track of the time that I take up dreaming which I should be using for this final revision; however, some of those important friends are insulted by my absence, thinking I’m distancing myself from their devotion. Likewise, I’ve received by email complaints from other friends, asking for more warmth from me, which I consider as personal pride; but I’m not lying if I confess to them and explain that when I write short stories, in general, they’re created by a breath, a hit of a chisel that sculpts them with a minimum of blows. It’s not like that with novels: Then this breath is converted into a persistent state while its realization lasts. I’m possessed for months; an ecstasy keeps me transported to the actual time of the plot in question. It’s the most effective way, particularly for me, to advance and master the characters and their conflicts. Of course at this rate I’m afraid of being alone and without a social life, and I question whether I work well or badly by remaining isolated, like being expelled from the real world, delivered to the profession of writing. But what other quality of life could I assume if it’s the only way I know of feeling useful, to breathe in peace, to bring to my dear friends themselves, brother masons and brothers in the struggle, through my texts, that reflection on justice and nobility for the society where we come together? I write for my time, and my spaces of struggle and longings converge: friendship, fraternity and unity in political activism. Although I appear to be absent, I am, through literature, very close to each one of you and to the national problems that I try to reflect in my books. And very soon — between this writing and the next — I will appear to receive your hugs with the same zeal with which I profess to you that I hold your friendship, in order to then celebrate together a new birth of that literary son that I bring into the world, that I humbly bring to the national culture, our struggle and our shared dreams. But God makes me lower my head and return every day to ask all of you: If I didn’t have you, then why am I creating literature? For whom would I write? I wish you a Merry Christmas, although we are aware that it won’t be as we would like while the dictatorship exists. 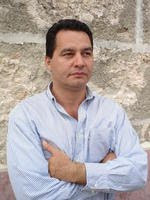 Angel Santiesteban Prats, 26 December 2015 — State Security is using all the tools in its arsenal to denigrate Cuban dissident Antonio Rodiles, who is currently the most uncomfortable thorn in the side of the regime, in the court of national and international public opinion. Rodiles is one of three organizers of the Forum for Rights and Liberties. In conjunction with the Ladies in White and other human rights organizations, the group promotes peaceful Sunday marches — demonstrations which have been causing great harm to the regime — under the hashtag #TodosMarchamos. Following mass at St. Rita Church, the group meets — as coincidence would have it — at Gandhi Park, and walks in a peaceful weekly procession along 26th Street to Third Avenue. They do this knowing that what awaits them, Sunday after Sunday, is one of those operations mounted by the repressive forces of the Castro clan to which we have become so accustomed. Fortunately, however, images of every repressive attack are recorded, leaving no doubt as to what is really going on. The reaction by the regime is clear evidence that Rodiles is hitting them where they are most vulnerable: the nerve center from which they have zealously maintained, for more than half a century in power, social discipline. As usual, they have used nastiness, lies and posturing in an attempt to strip him of his personal attributes, actions which have caused outrage because of the cowardice which they have been concocted. This is a well-known tactic, one that has been used many times before on other opposition figures. The macabre plan is to first tarnish his image and, once they have sown doubt about him in the public’s mind, to then imprison him, because putting Rodiles behind bars is a longstanding dream the political police will always fight to achieve. This smear campaign recently began after Rodiles returned from the United States, where he was invited to speak at a congressional debate in Washington on the topic of Cuba. He later met with prominent Cuban-American congressional representatives, who are calling on the government of Raul Castro to respect freedom and human rights on the island as a prerequisite for progress in restoring diplomatic relations. It is worth remembering that, upon returning home from his first such visit last year, Rodiles’ organization was the object of a cyber attack, albeit a relatively minor one. Those maneuvering to sully human rights activists are working hard to dismantle the Forum for Rights and Freedoms. To do this, they need to get Rodiles out of the way, dismember the Ladies in White organization and remove the obstacles blocking their path to remaining in power, as they have done for nearly six decades. If the Castro dictatorship reacts this way to someone like Antonio Rodiles, clearly it must be because he is doing something right. Persecuting him is payback for his political activism, for his constant defiance of the injustices that the regime perpetrates against those who oppose its plans. Neither the defamations aimed at vilifying him — in essence, because of his pride — nor the entire army of followers that the terrorist state uses to harass him will be enough. Nor will plotting to achieve spurious benefits succeed in changing our standards or our ideas. On the contrary, this shameful strategy convinces us even more of the need for a clean and democratic government. Havana, December 2015, “free” on parole. Angel Santiesteban-Prats. Military Prison, Jaimanitas. Just reported from Havana, that this afternoon Angel has called a relative and has said he was arrested for not having signed the Probation (order) last week and because there is a new accusation upon him. As we do not have the details, we will wait until he can tell us himself, about his situation to not make room for speculations. A few minutes ago I received a call from a relative of Angel Santiesteban-Prats to inform me that at noon Angel was arrested again. Upon contact with his family, they still did not know why he was arrested and what he is accused of. He said he would call later in the afternoon and still they have no news of him. 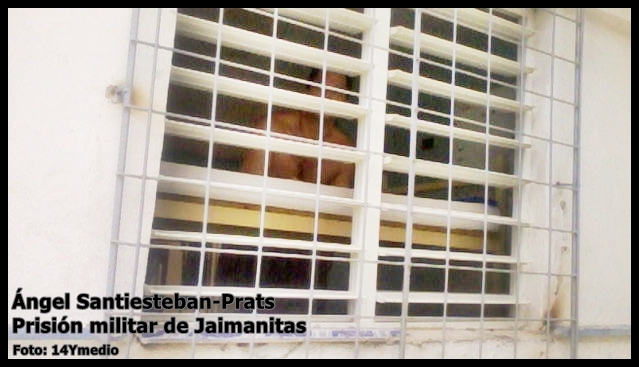 We imagine that it is a reprisal from Castro’s regime for having denounced the life-threatening danger political prisoner Lamberto Hernández Planas is in, on hunger strike, for having been the victim of a new maneuver by the State Security to revoke his parole and prevent his work as an independent journalist. 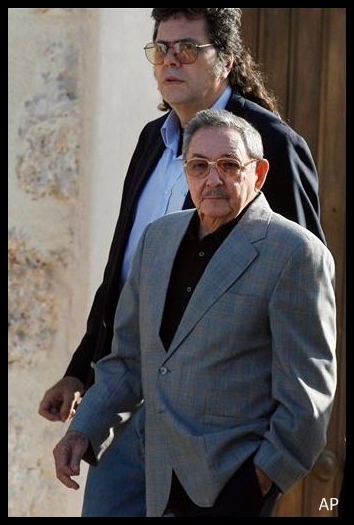 Once again, as usual for almost three years now, we hold the dictator Raul Castro responsible for the life and integrity of Angel Santiesteban-Prats. As soon I have news, I will keep updating. #Cuba Angel Santiesteban: Is Going to Jail Like Going to War? After this brief recount, anyone unfamiliar with his work would say he is a “lucky one” but the truth is that he always gets what is most important: the laurel of his readers. 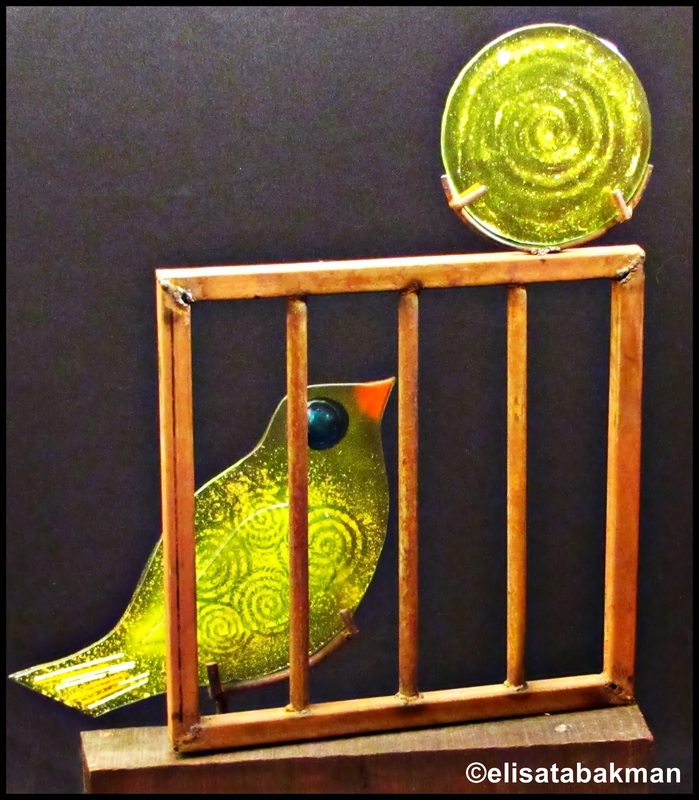 Life in prison is one of his recurring themes. Whoever starts reading his texts will discover it from the first line in many of his narrative pieces. It turns out that he was already in jail twice, and in a bunch of police stations. About prison and his work we talk for a long time, in my house, a few days ago. And now, while I transcribe our conversation, I learned that he was nominated by Reporters Without Borders to receive the Citizen Reporter award which was just awarded to a group of Ethiopian bloggers. 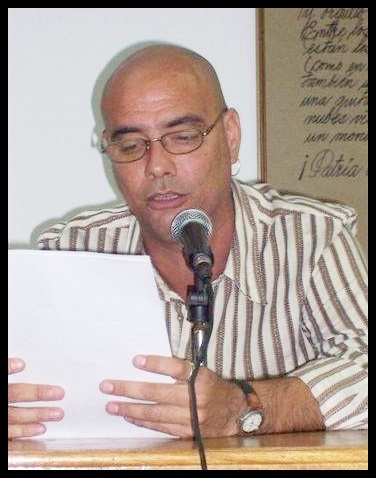 Jorge Ángel Pérez: Angel, not many Cuban writers have lived through the hell of prison for two terms. Were they useful for the writer those two stays? Angel Santiesteban: I think so. Being in prison helped me have the spontaneity and sincerity required in literature. That openness will always remain. That is why as I walked those two times to that hell, I thought of the stories I could find, how would they serve my work. To think that I was in search of material to write saved me, it made less harsh those stay. Angel Santiesteban: I found them there and they were the ones that saved me. Going to jail is like going to war. The prisoner and the soldier have much in common. The two are away from home. The two are withdrawn. Both have sexual desires they cannot fulfill. The two are under military control and that can be abusive and impose itself, often in a humiliating manner. Every day you are in danger of losing your life; in prison by the hands of a criminal and in war the enemy can kill you. Jorge Ángel Pérez: While there you found stories that would serve you later, but the truth is you did not go voluntarily to rummage in jail and in prisoners’ behavior. Angel Santiesteban: I went because I was led, bound. The last time I went to jail because I believed, and still believe, I could do something for my country to be better, to make it democratic. Fidel once said that a better world was possible, and I went to seek a better world, to look for that better Cuba. That cost me jail. Because I wanted to get that world I began in my house, in this country that I love. My literary teachers had told me that the important thing was to write, it was my work I should look after, the first thing was to write, and publish, get readers. Write, write and write. Many friends, and those teachers, they thought a writer does not have to do anything else. Jorge Ángel Pérez: And don’t you think so? Angel Santiesteban: No, I don’t think so. That’s a lie, although I believed it for many years. For a long time I devoted myself only to writing. 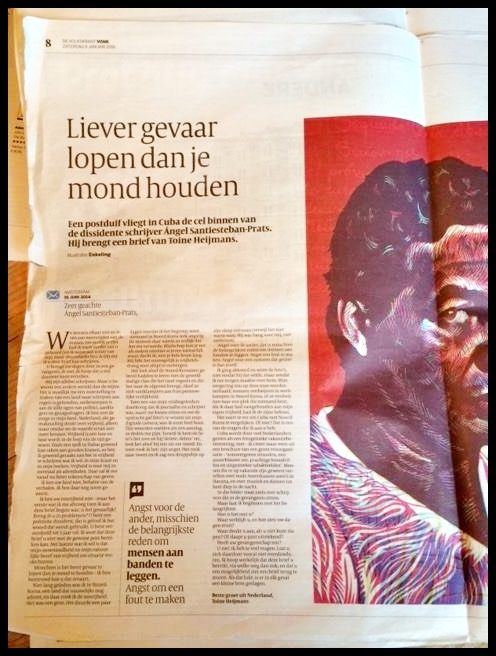 I put together my work, I published books and keep quiet …because of fear. Jorge Ángel Pérez: And where did you leave that fear? Angel Santiesteban: It is still with me. It never left, but I learned to accommodate it. It never forsakes me the fear of going to jail. There you can die in an instant, and that’s terrible. Fear comes when I think that I can not be with my children and with my family at the moment they need me the most. Imagining that moment impress me a lot. It scares me to think of the possibility of they getting sick and can not help them. My daughter did not attend college when I was arrested the last time and that made me feel responsible. Jorge Ángel Pérez: And who was responsible? Angel Santiesteban: Viewed in a simply way it should be me, but the real blame lies with those who arrested me. It was the unjust detention what distressed me. It was the possibility that her father went to jail again that made her sad, because of that she decided not to go to the classroom, because of that she missed the class, because of that she will have to justify her absence. I imagine how many times she thought she would have to go back to visit the prison to accompany her father in his confinement. Who are the real culprits for her distress? Is it me? It makes me very happy she studies. I want her to graduate, and nourish her desire to study, but a young student will not feel very comfortable in a classroom knowing her father is imprisoned unjustly. It was also distressing when I saw them coming to the prison. Seeing seventeen or eighteen kids visiting an inmate is not comforting. My first confinement had to do with my accompanying my family to the shore line when they wanted to leave the country for good. I ended up in prison, but I had no children. The last time they were grown already and they studied. Their father was arrested for going around seeking democracy. And they knew what that could cost me. Jorge Ángel Pérez: What is democracy for you? Angel Santiesteban: Speaking my mind out loud and that nobody bothers me. Saying what I want and that everyone understands that this right exists and it pertain to all of us, that everyone understands that there are different ideas the ones professed by our rulers. Is it so difficult to understand that? I think it’s good to talk, and that the differences you have with those in power do not take you to jail. That’s democracy for me. Jorge Ángel Pérez: And are you willing to talk to get this democracy? Angel Santiesteban: Of course, that what this is all about. I can talk to a Communist if he is able to listen to me respectfully, if he allows me to act according to my principles. I have that right, although they take it from me I know I have it. I can also talk with a liberal. I can converse with those in power and those who oppose to them even though we don’t agree on everything. I wouldn’t talk to those fomenting terrorism. 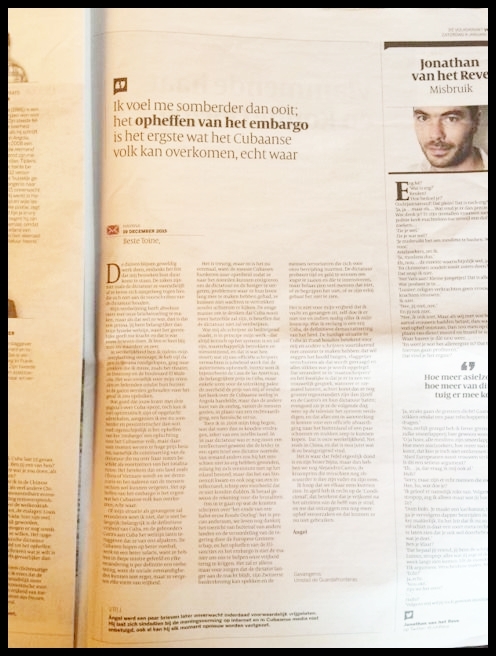 In that table I want to defend my right to express myself. If I have a political activity now is because I intend to find that democracy where everyone can live in, even with their differences. I would love it if in the future someone talks about me, that if I am just mentioned in one line , that’s what they say about me. Jorge Ángel Pérez: And about your writing? Angel Santiesteban: I prefer it is talk before the effort I put into getting the dialogue, about my dreams of democracy, it must say that I faced those who would not let me express myself. That I want, and it must be said very briefly in just one line. Jorge Ángel Pérez: Just recently you were arrested in a police station. Why? Angel Santiesteban: All I can say will be a speculation, everything would be an assumption. I don’t have the truth. I think it was something more than a threat, they intended to revoke my probation, which would take me back to jail. Jorge Ángel Pérez: Why do you think that? Angel Santiesteban: I was told there was a complaint from my ex-wife, the mother of my son. They showed it to me and I recognized her signature, but she told our son she had not accused me. They could forge her signature to intimidate me. I haven’t seen her in a long time, so there was not such a threat, but then (freelance journalist) Maria Matienzo went to the police station inquiring about me, and she was told I was imprisoned for armed robbery, however (Antonio) Rodiles was told the same thing they said to me; that I broke into the home of the mother of my child. They never agreed among themselves to give the reasons for the arrest. I believe, and this remains an assumption, that it all had to do with a text I wrote the day before being arrested denouncing the imprisonment of Lamberto Hernandez Planas, where I commented on his hunger strike, the risks for his health, and I also demanded his immediate release. Everything has to do with my political activities, my opposition. I did not threaten anyone and much less committed an armed robbery. Jorge Ángel Pérez: What happened afterward? Angel Santiesteban: Afterwards my son tells me that his mother had not accused me, certainly the ones who had arrested me knew, they stopped showing the alleged accusation of my ex. The next day I was taken to the provincial court. When we arrived, the police officers accompanying me wanted to know in which room the trial would be held and someone said to take me to an office. There the president of the court was waiting for me and told me that my freedom had been revoked. There was a brief silence and then she continued. She said that despite the revocation order she would set me free, and suggested that I behave, that I should behave. Jorge Ángel Pérez: And do you think you could go to prison again? Angel Santiesteban: Maybe, but I hope the excuse to be less dubious that the one that took me to jail last time. If they were less awkward they should send me, if there was a next time, on a fellowship in Paris or Berlin. Never to jail. That’s the worst thing you can do with a writer. Can you imagine what you could write there? Jorge Ángel Pérez: I do not want to imagine it, it frightens me. 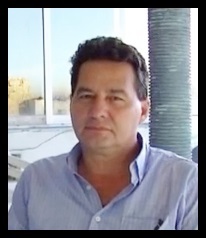 Angel Santiesteban: A writer will write everything he sees, everything will serve him. A criminal will hear the stories of others and perhaps they will serve him for the next wrongdoing, but a writer will analyze every detail, every gesture, every story, and then he will not be able to resist, he will write, and people will read it, people will find out what happens there. Being in prison is like walking through the bowels of the country. Imagine that reader when reading those rotten descriptions. Everything I saw nourish that desire to write, to publish in my blog, to write stories, to do what I think is best for my country. There I wrote a lot. I wrote stories, from that stay in jail came out a novel. From the stories they told me during those hours I spent at the police station could emerge many narrative pieces. And there’s also my blog. From there I will continue telling, without stopping, without them get me to stop. We still don’t know why he had been detained for 24 hours. He will explain shortly and we’ll offer more details. Angel Santiesteban “on probation,” Havana, 5 December 2015 — On Saturday, November 28th, there was a meeting at the “Fresa y Chocolate” center in Havana, of the Assembly of the G-20 as they have been called, this group of twenty directors of the seventh art — which has the desire and the priority that the dictatorship accept, finally, a Film Law with which they can obtain a space of personal freedom for their art. That is, to be able to conquer creative liberties in favor of independence from the bureaucracy that has, until now, made them in their entirety bow down to the government. For all we know, so far, they have not sent the hit-men to intimidate the “G20”. Although the Government has not yet presented its real face — because of the scandal that would arise when dealing with internationally recognized filmmakers — it is possible that they are cooking up something against this group so difficult to re-educate. So far they pretend to ignore them, perhaps betting they’ll wear themselves out. The firefighter that the dictatorship has used in the past twenty years for these acts of insurrection, is the well-known Abel Prieto, who served once as President of the National Union of Writers and Artists of Cuba (UNEAC), then as Minister of Culture, and today, as tyrant Raul Castro’sAdviser. But they have worn out this character Prieto to such an extent that a large percentage of artists do not believe his words anymore and consider him a kind of Cardinal Richelieu, creator of intrigues and persecutions against those who do not abide by his directive. It is clear, there is no other character that could dialogue with this group of artists, so it would not be surprising that at some point he wears the “matador suit” and must enter the ring to face the bulls. But returning the purpose of this writing, I should describe the events of the last meeting of the G-20, admitting in advance that the filmmakers are hostage to the so-called “Revolution” whose makers became dictatorship figures almost from the beginning. The totalitarian system maintains a tight grip on artistic production, maintaining an exhaustive and constant eye on this genre that attracts such a large audience; and because as the government knows what is at stake if it accepts granting them “independence”, it refuses to untie their hands and minds, preventing them from doing and undoing what they please with their art, because they know that soon, it would bring discredit, criticism and ridicule from art, without their being able to act against them. The most direct and effective effort so far, has been the attempt to expose and demand a debate at last congress of the UNEAC, when the filmmaker Rebeca Chávez proposed opening the subject and the sinister official Abel Prieto acted as a censor in the most violent and despotic way imaginable, and radically prevented the director from presenting the needs filmmakers have today. This “Cain” in disguise as Abel, feverish for power has become today the most intransigent cop, and the more fanatical persecutor of those creators who dare to raise discrepancies with the cultural power or political power, and all this when he should be the bridge between artists and the government instead. The vast majority of those attending the Congress were offended by that political official’s outburst, from a man who was once a colleague, someone who pondered, defended and represented art in general, but the more power he has gained in the Nomenklatura the more he has been betraying the principles of commitment to genuine art. Understand that, “delegates” chosen in the congresses of the guild, are, mostly, the most “committed”, those who, having passed through the scrutiny, and so they were unable to rebel against official orders — although they were the most unfair — and in the most disciplined of fears they remain quiet before the abuses and injustices of the dictatorship. At the Assembly on the 28th of November, a fraud perpetrated in the election of the authorities of this congress was exposed, as those who got the most votes from the artists, were later replaced by the docile ones, whom they exchanged for the chosen ones in order to take to that meeting the most submissive and manipulated to lift their arms in favor of the government and, ultimately, to refuse these spaces of freedom that urge the artist and the times they live in. Replacing elected ones by the meek ones has been a common practice for years; and in some post I stated that I witnessed these frauds, where Abel Prieto pointed his finger at those who had showed him such pusillanimous attitudes. The filmmakers, dissatisfied with the government’s attitude and its envoy Abel Prieto, decided to continue gathering to achieve their aspiration, approval of a long-awaited Film Law. And in that sense Gustavo Arcos was very specific, talking about movies currently censored by the Cuban Institute of Cinematographic Art and Industry (ICAIC), also raising concerns about the state of the national cinema, and calling for the discussion to be sustained with the counterparty which denies the Film Law. He recalled the times that Fidel Castro met with the filmmakers “to save the cinema” and that — since the ancient dictator is no longer in power — that interlocutor who, without revealing his face, denied the necessary Film Law from the shadows should be sought, including Raul Castro, Diaz Canel and, according to some of those present, Alfonsito Borges, that grim and mediocre “administrator” of the culture who has done so much harm, and now serves as ideologist of the Party Central Committee, and demand that he answer why he considers that the Cuban films that are censored are also “counterrevolutionary” and to explain “where, how and why these films are against the Revolution, and have a dialogue with the decision makers and probably those considered counterrevolutionary: Alfonsito Borges, and I do not know the others (…). And in full assembly state security appears imposing their terror (to be continued). In the midst of the Assembly of the G-20 (as a group of twenty film directors call themselves), while the filmmakers debated the need for the approval of a Film Act and continued to denounce the hairy hand of censorship with Abel Prieto as its visible creator, as recently happened against Juan Carlos Cremata, a scream alerted that State Security was trying to expel one of those present. 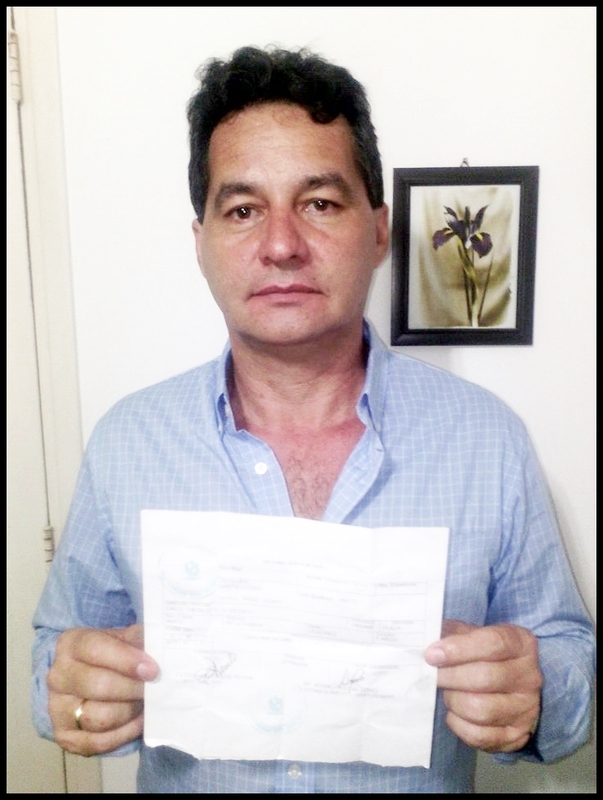 It was Eliecer Avila, who was attending as a member of the general public until he was discovered by an agent of the regime. When the agent entered the room to expel him, he was rebuked by some of those present, although most preferred, as usual, to keep silent, because they knew that he was one of those shadowy figures who swarm cultural institutions and is responsible to pursue, monitor and warn them, and to make them regret their “mistakes” later on. 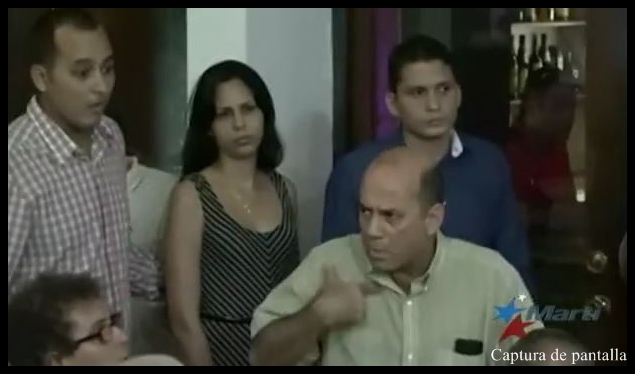 Everyone in the room stood up and approached the door where the official from ICAIC (Cuban Institute of Cinematographic Art and Industry) and the agent of the State Security pressured Eliecer to leave the room, telling him that his presence stained what they were trying to build there. Finally, Eliecer, despite assuring he was revolutionary, which didn’t matter to either the “seguroso” nor the ICAIC-official, refused to leave the room and the meeting continued with those present on their feet. They agreed, through voting, try to reach a bridge of dialogue with the pertinent state authorities. It is unfortunate that once again they usurp spaces from artists, because only they had the right to ask Eliezer to withdraw from the room if they felt he should not be present. I guess State Security will demand that the next Assembly of the G-20 will take place behind closed doors. However, looking at the gains from these troubled waters, I think that the presence of independent journalists has alerted the dictatorship to an understanding that the issue of the filmmakers is getting out of hand and becoming international news, and although their media prohibit publishing that information, they can not prevent us, independent bloggers, from doing it. Hopefully our presence there has forced the dictatorship to accept that they must negotiate with the G-20 to restore what belongs to them in their own right: freedom of creation, something that never should have been seized with the justification of making a “revolutionary” cinema. I thought I had finished recounting the events at the Assembly, but something told me I should wait; we could expect some reaction after that altercation. And this December 3rd, TV reported a meeting of the plenary of the UNEAC (National Union of Writers and Artists of Cuba), led by the government firefighter Abel Prieto, where they pledged to “not allow artists and their spaces to converge with the counterrevolutionaries”. 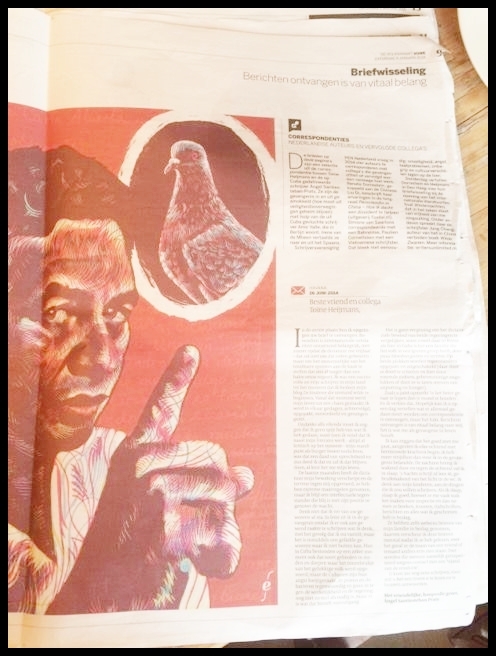 It was the stubbornness I expected from State Security, the Communist Party and the leadership of the Union of Writers and Artists of Cuba; the coherent response of the dictatorship to a dilemma that is getting out of hand. I am sure that this time the “counterrevolution” which is how they call us, the ones who are fighting peacefully for freedom and democracy, will push for the necessary dialogue between filmmakers and dictatorship to finally take place. I received an anonymous call from a “concerned” person about my likely attendance at the inauguration of the New Latin American Film Festival. Angel: -Ok, I am listening – I insist. Unknown: -Just to tell you, you will not be welcome at the opening of the Film Festival. Angel:-That does not sound like an advice, is seems more like a threat. Unknown:-Take it as you want, but don’t regret it later. Angel:-I will be present anywhere I please -I say upset. Unknown:-Do not think that we will again allow you to interfere with your presence as you did at the “Fresa and Chocolate” meeting room. We do not want you at the Karl Marx Theater, neither at the opening nor at the closing. Angel:-Well, you do your part that I will do mine. -and I hung up. I did not want to go anyway, but it mortifies me they want to manipulate their instruments of fear.